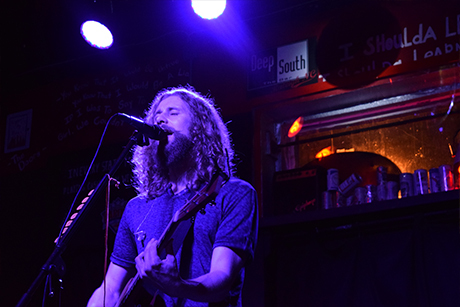 Deep South The Bar presents raw talent in a welcoming, friendly environment created by genuine music fans for genuine music fans. 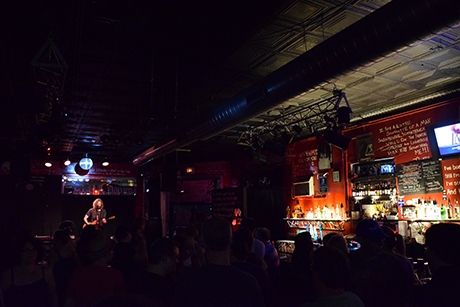 With 365 shows per year, the hot spot promises visitors a stellar night of live music any night of the week. And my night at the music venue last Thurs. was everything stellar. As soon as I heard that Raleigh&apos;s one-man-band and singer-songwriter Adam Pitts was playing, I made plans. When you&apos;re greeted at the door, you feel like you&apos;re at the door of a friend&apos;s place—you&apos;re greeted with a smile and a warm welcome. Upon walking in, you can see the entire venue. The layout is simple, yet it&apos;s an intriguing space to explore, detailed enough to spend hours taking everything in. 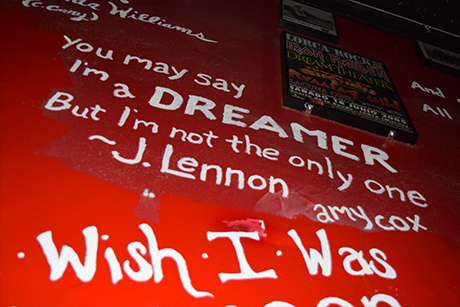 Lyrics are written across the walls with concert posters and more in between. You&apos;ll feel inclined to look for lyrics you recognize, and you will, quickly. "You may say I&apos;m a dreamer, but I&apos;m not the only one. ~J. Lennon" caught my eye. A pool table sits near the entrance and the stage captures your attention at the back of the venue. To your left, booths line the wall. To the right, the bar glows with a lineup of drinks, an artfully hand-written drink menu, memorabilia and photos and yes... strings, drums sticks and more are for sale for musicians who need emergency gear during a gig. For those wanting some fresh air, hop outside to find outdoor seating, with a fantastic view of the Raleigh Convention Center&apos;s CREE Shimmer Wall and some of downtown Raleigh&apos;s skyline. All-in-all, getting comfortable for the night happens very quickly. The drink menu rocks, with cocktails themed appropriately for Raleigh and the venue. Order The Hopscotch, named after Hopscotch Music Festival, with Bulleit Bourbon, St. Germain liqueur, lemon juice, simple syrup and Champagne. Try The Cherry Bounce, the drink that helped Raleigh become North Carolina&apos;s state capital and the first cocktail ever served in Raleigh, with cherry vodka, cranberry juice, a splash of lime juice, club soda and cherries. On Thurs., Greater Raleigh beer on tap (draft selections are switched out periodically) included Aviator Brewing Company Mad Beach and Big Boss Brewing Company Angry Angel, plus three other beers brewed outside of Greater Raleigh. The bar also serves bottled brews and wine. 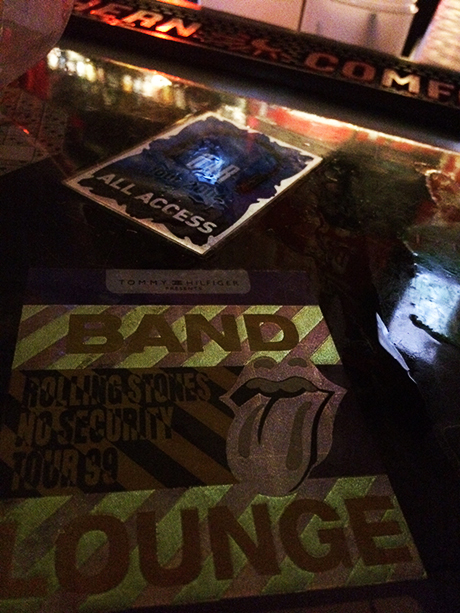 Check out the collection of backstage passes and credentials from countless major concerts under the protective surface of the bar itself. Adam Pitts took the stage soon after I arrived on Thurs. Building beats, bass lines, orchestrations and harmonies live and on-the-spot with his acoustic guitar, loop pedal, voice and sometimes a keyboard and kazoo (I&apos;ve seen lots of solo artists use a loop pedal, but Pitts is a master), he popped off intriguing versions of covers ranging from A&apos;ha&apos;s "Take On Me" to "Kiss" by Prince to "Baby Got Back" by Sir Mix-a-Lot and more. 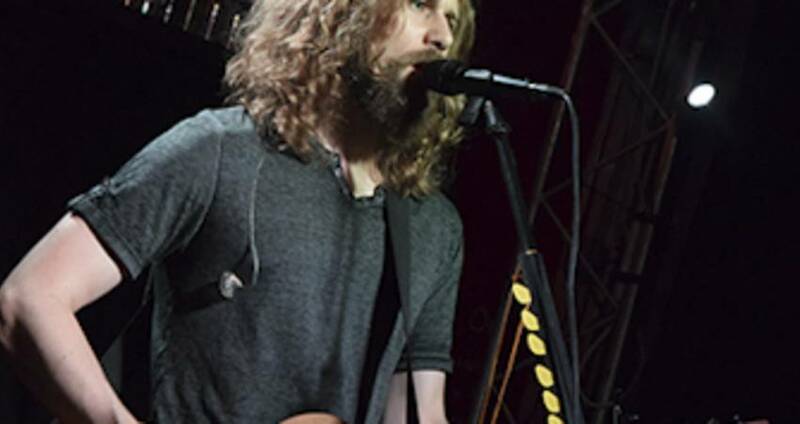 His voice&apos;s timbre and pitch are dead on, fitting perfectly with his song selection and impressing audiences at every performance that I&apos;ve seen of his. Soon after Adam Pitts started up, it wasn&apos;t long before the crowd filled the venue and dances broke out in front of the stage. Throughout Pitts&apos;s performance, the energy never dwindled. Music fans like myself honed in on Pitts&apos;s talent and also discussed new major album releases and upcoming shows in Greater Raleigh with fellow crowd-members. Deep South The Bar is without a doubt a popular gathering space for musicians and fans of quality music. Speaking of quality, I honed in on the sound system&apos;s quality and the mix quality—the sound was nothing short of outstanding, with frequencies not too harsh and the volume at a perfect level. 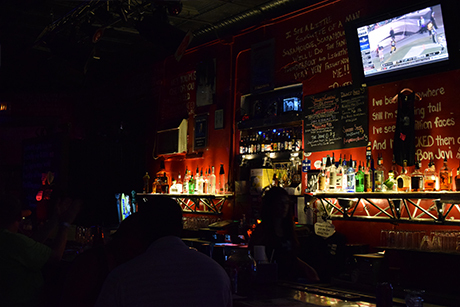 When you visit Raleigh for live music, you should definitely hit Deep South The Bar, even if you just catch a few songs and grab a drink. The venue is a "can&apos;t-miss." Check out the lineup of concerts ahead of time or drop in on a whim at night. 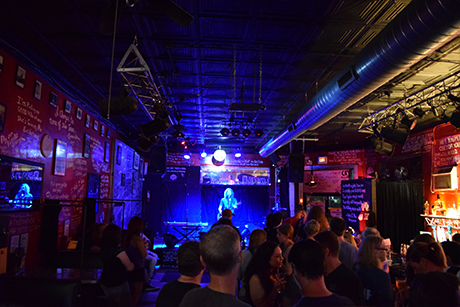 If you&apos;re a musician visiting early in the week, the venue hosts open mic nights on Tuesdays, so you can share your talents in Raleigh—check out the open mic FAQ here. 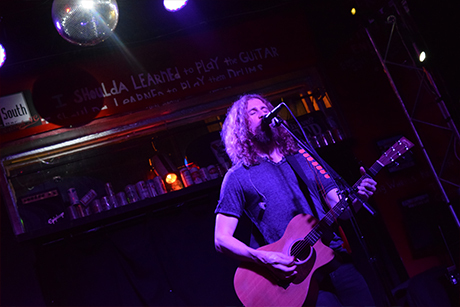 Experience a music venue that stays true to presenting raw musical talent in a genuinely-friendly atmosphere. The venue is located right in the action of downtown Raleigh, adjacent to Red Hat Amphitheater, which will present artists including Lorde, Earth, Wind & Fire and PNC presents Wide Open Bluegrass this summer and fall. In fact, crowds of Music Maniacs seeing their favorite artists at the amphitheater can walk across the street to hear even more music at Deep South The Bar, before and after concerts. Deep South The Bar is easy to spot from the amphitheater—just up the hill on the corner of S. Dawson and W. Cabarrus Sts. Rock on and see you at Deep South The Bar!